Play Theory: This is a fairly simple flag football play that can net a lot of YAC (Yards After Catch). Blue’s job on this play is to clear out and open some space for Red. The Quarterback should look to throw the ball early to Red. The idea is for Red to catch the ball and immediately run up field. If the ball is thrown late, Red will run into the Linebacker coverage. The second option would be Green. Green’s route is dictated by the coverage. Against a cover 2, Green will be covered by either the Cornerback or Safety. If the Corner is covering, the best route will usually be the streak. If the safety is covering and continues to drop as Green runs up field, then Green should stop the route short and hook. 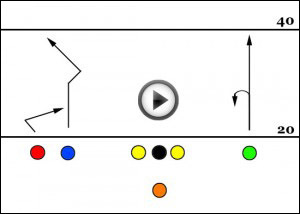 Receiver Tip: The Green receiver on this route has a choice: Streak or Hook. When running the route, the receiver needs to pay attention to the covering defense. If the defensive back stays in a back peddle, then the receiver should be able to run right past on the streak (providing the receiver has some speed). If while running the streak, the defender breaks down and turns to run up field to run with the receiver, this is when the receiver breaks off the route and hooks. The Quarterback should also make this read. Once the defender turns and runs up field, the QB can throw the ball to the spot where the receiver will come out of route. Developing a few timing routes such as this will provide a huge advantage as you play against better competition. For additional free flag football plays visit the Free Plays section of the site.